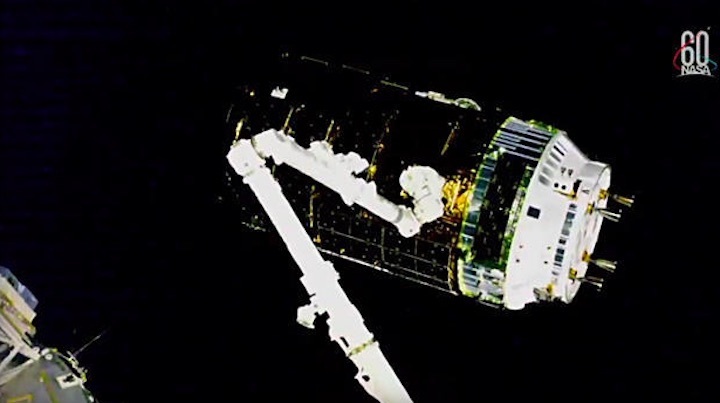 The Japanese HTV-7 cargo ship floats in orbital darkness moments after capture by the International Space Station's robot arm. A Japanese cargo ship loaded with more than 10,000 pounds of supplies and equipment, including a new set of solar array batteries, was captured by the International Space Station's robot arm early Thursday to wrap up a trouble-free rendezvous. With station commander Drew Feustel and Serena Auñón-Chancellor operating the Canadian-built arm, the HTV-7 "Kounotori" cargo craft was captured at 7:34 a.m. EDT (GMT-4) as the two spacecraft were passing 251 miles above the northern Pacific Ocean. "HTV capture is complete, the arm is safed. And I just want to say that we're delighted to see HTV-7 arrive at ISS," Feustel radioed flight controllers. "Thanks to the JAXA (Japan Aerospace Exploration Agency) teams for working so hard to successfully launch this vehicle in spite of the recent challenges with hardware and weather." "Thanks for the words," replied Japanese astronaut Akihiko Hoshide from Houston. "Congrats again on a successful capture of the seventh HTV bringing more batteries, (science) racks and other goodies to the International Space Station." With the HTV-7 safely in hand, flight controllers at the Johnson Space Center were standing by to take over arm operations and remotely pull the cargo ship in for berthing at the Earth-facing port of the station's forward Harmony module. The HTV's pressurized hold, the section accessible to the station crew, is loaded with 7,500 pounds of equipment and supplies, including more than 1,300 pounds of crew food, clothing, personal items, computer gear and spacewalk supplies, 2,800 pounds of station equipment and spare parts and 3,300 pounds of research equipment and material. Mounted in the spacecraft's unpressurized cargo bay are six powerful lithium-ion batteries that will be installed at the base of the station's port-4 solar array segment. They will replace 12 aging nickel-hydrogen batteries that were launched with the arrays as original equipment in 2006. Most of the space station's electrical power is generated by two huge sets of rotating solar arrays, two on the starboard, or right side of the lab's power truss and two on the left, or port side. The batteries deliver power when the station is in Earth's shadow and are recharged when the arrays are back in sunlight. NASA is in the process of replacing all four sets of solar array batteries. The system originally used 12 batteries for each set of arrays but the replacement units pack twice the punch, so only six are needed per set. The HTV-6 cargo ship delivered the first set of replacements in December 2016. They were installed on the starboard 4, or S4, solar array segment during two spacewalks in January 2017. The batteries carried up aboard HTV-7 will be install on the port 4, or P4, truss segment during two spacewalks next month. NASA originally planned to install the new batteries this month, before Feustel and his two Soyuz MS-08 crewmates -- vehicle commander Oleg Artemyev and Ricky Arnold -- return to Earth next Thursday. But the HTV-7 launch was delayed 12 days by bad weather and a technical issue and there is not enough time available to make the necessary spacewalk preparations before Feustel and his crewmates have to depart. The Soyuz MS-08 crew is scheduled to land on the steppe of Kazakhstan at 7:45 a.m. Oct. 4, closing out a 196-day mission. Their station crewmates -- Auñón-Chancellor, Soyuz MS-09 commander Sergey Prokopyev and European Space Agency astronaut Alexander Gerst -- will have the station to themselves for one week before two fresh crew members arrive. Soyuz MS-10 commander Alexey Ovchinin and NASA flight engineer Nick Hague are scheduled for launch from the Baikonur Cosmodrome in Kazakhstan on Oct. 11, arriving at the space lab later that day.